Mesut Ozil didn't travel with the Arsenal squad this weekend despite being fully fit. Arsenal supporters don't particularly take defeat well. But it only makes things worse when a player on £350,000 a week doesn't even make the squad. Yet questions about Mesut Ozil in Unai Emery's press conference were dodged somewhat by the Spaniard as he reacted to an uninspiring 1-0 defeat for his side to West Ham. The Gunners were dismal, lacking quality in key areas, appearing bereft of any sign of creativity. So why I hear you ask, was Ozil left out of the matchday squad entirely? It's a baffling saga that at the moment sees no end. The German trained all week and was perfectly fit for this weekend's clash at the London Stadium but was left out yet again due to tactical reasons. Looking at Arsenal's bench, they had two attacking substitutions they could have made; Aaron Ramsey and Eddie Nketiah. One is destined for pastures new and the other lacks experience at the top level. Hardly awe-inspiring changes considering their situation and it proved as much when Ramsey failed to ignite a spark that was missing. Could Ozil have provided it? It seemed a game tailor-made for the World Cup winner when no other Arsenal player could dictate the tempo. Commenting on why the German wasn't involved, Emery noted: "I think we have enough players to win today." The Spaniard didn't say he got things wrong but his selection today certainly lacked attacking options. After further questioning about the situation of Arsenal's highest paid player, he commented: "He was working this week normally. We have won with him and we've lost with him. Today the players that are here I decided to have for this match." Arsenal had half chances through Alexandre Lacazette and Matteo Guendouzi who fired off target in the first half but they were rarely able to find space in behind the Hammers backline. "We created some chances but it isn't enough. Maybe the first 20 minutes when we had some chances is the moment we can start thinking to win this match, but after it is difficult because we didn't impose on the 90 minutes all the things we wanted," Emery asserted. A few chances came late on but barring Alex Iwobi pulling an opportunity inches wide of the far post, they rarely came close. Laurent Koscielny had a late goal ruled out for offside but that was as close as Arsenal came to finding space in the opposition's penalty area. The Gunners form of late has been far from convincing and as a result, they find themselves dropping off the pace in the race for the Champions League places. A win for Manchester United this weekend will see the two teams draw level on points whilst Chelsea can go six points clear of the Gunners in fourth. "I think the result is bad," admitted Emery. "We lost a very great opportunity to take the three points and continue to get closer to Chelsea and other teams in the top four. But we lost. We wanted to do better," he added. If Arsenal have issues in attack, then they certainly do defensively. Following today's game, the north London side have achieved just three clean sheets in 22 Premier League games this term. The way they conceded just about summed up their soft nature. Granit Xhaka failed to clear properly from a corner, meaning Declan Rice could fire home from Samir Nasri's pass. 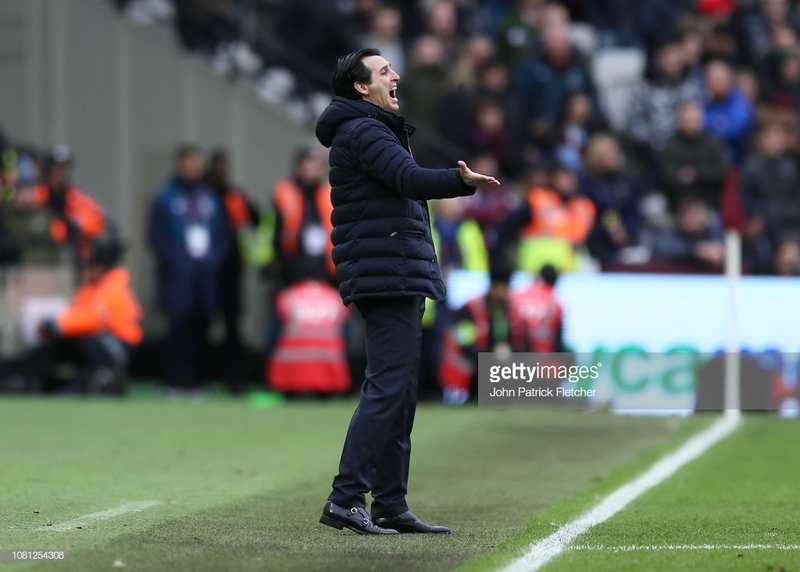 Assessing the match, Emery said: "They had a lot of corners and from one they scored and then the match is changing. We needed to attack more and better but they defensively worked well. We created some chances but it isn't enough." This week the Arsenal manager confirmed that the club wouldn't be able to complete any permanent deals in January. That only becomes more concerning following the Gunners lifeless display on Saturday afternoon.